It's been a hectic few weeks for the 3D industry in terms of trade shows. From 3D TVs and consumer electronics at IFA in Berlin, 3D home cinema projectors at the CEDIA Expo in Indianapolis, 3D broadcast and production at IBC in Amsterdam, and last week the big names were all presenting at the 3D Entertainment Summit and 3D Gaming Summit in Hollywood. The view from each of these events is that 3D is progressing despite the many column inches still being devoted to its failure. Unfortunately due to direct clashes and workloads, we could only attend one of these events and this year we chose IBC. Against the backdrop of the first Wimbledon 3D broadcast and the announcement that the London 2012 Olympic Games will get more than 200 hours of 3D coverage, I was expecting great things from IBC 2011 and I wasn't disappointed! Industry acquisitions such as 3Ality Digital of Element Technica, and Adobe of IRIDAS, also signal market maturity - and the show floor exhibits reflected this. There's no denying that James Cameron and Vince Pace grabbed the headlines, and whether you agree with everything they propose for 3D production or not, the fact that the CAMERON | PACE Group is opening a London office will generally boost confidence here. I'd like to welcome all our new subscribers who signed up at IBC and who took the time to tell us about their 3D experiences - there are some very interesting and creative 3D projects taking place in the EMEA region and we look forward to covering them in the future. Our 3D @ IBC 2011 Spotlight provides a useful archive of the event, but please let us know what we missed. 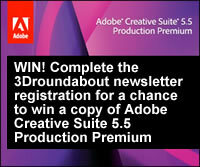 And finally, today is the last day for entering our prize draw to win a copy of Adobe Creative Suite 5.5 Production Premium. If your name does not appear at the beginning of this newsletter, then you need to complete our newsletter registration form. If this newsletter greets you by name, then you will be entered into the prize draw automatically. This month our articles are kicked off by Al Caudullo of 3DGuy Productions, who gives a spellbinding account of chasing the Mongolian Naadam horse race using 3D cameras. Steve Shaw of Light Illusion serves up the second part of his fabulous seven-part series on the basics of shooting S3D. Part 2 explains the difference between parallel and converged shooting. We have two amazing case studies; the first is by Nicolas Henri Sieber of Kamerawerk, who made a high-speed 3D short film using a model, a trampoline and various types of confetti; the second is by Samuel Martin of Decode, who shot a troupe of street dancers in tight spaces using huge and heavy camera rigs. I cover our 3D highlights from IBC 2011 in Amsterdam, and Bernhard Schipper of 3DStockContent.com takes a look at markets trends from the perspective of the recent IFA trade fair in Berlin. Raymond Soneira of DisplayMate Technologies presents the results of a shoot-out between active and passive glasses TVs, and encouraging market data is provided by Jim Bottoms of FutureSource Consulting, who looks at how 3D at home is growing. Enjoy! Use VIP Code CCG22 to apply for your complimentary pass.